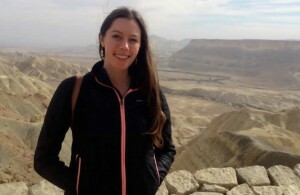 Claremont, Calif. (June 13, 2014)—Pitzer College student Allison Donine ’16 has been named a Doris Duke Conservation Scholar. As a Doris Duke scholar, Donine will participate in mentored research activities in conservation biology and other related disciplines, including land, water and wildlife conservation. She will spend 10 weeks in the Grand Canyon region, participating in a conservation immersion program and interning with a conservation nonprofit. At Pitzer, Donine has served as a research assistant for the Ontario Real Food Project, which addresses issues of food justice in Ontario, Calif. In 2013, Donine participated in Project Pericles’ Debating for Democracy National Conference in New York City. She also won a 2014 Benjamin A. Gilman International Scholarship to support her plans to study abroad in Nepal this fall. Allison Donine is majoring in environmental analysis at Pitzer College. The Doris Duke Conservation Scholars Program, hosted by Northern Arizona University’s Landscape Conservation Initiative, is a multi-year program funded by the Doris Duke Charitable Foundation that serves to strengthen the conservation profession by training students who can make significant contributions to broadening the field of conservation.